Larkin Heyward's life in the beach town is uncomplicated, mostly volunteer work and dancing at the Pavilion. But she dreams of one day doing more and being more--maybe moving to the hills and hollers of Kentucky to help the poor children of Appalachia. But she's never even met someone who's lived there--until she encounters Judd, the newest employee at her father's timber company. Drawn together in the wake of a hurricane that changes Myrtle Beach forever, Judd's and Larkin's dreams pull them in divergent directions. It will take a significant sacrifice to keep them together--or maybe, it will take a miracle. Judd Markley wakes up after a mine collapse and his only thoughts are for his brother Joe and the other miner's safety and welfare. When he's brought out of the mine and recovering in a hospital, he's told that his younger brother Joe was one of the fatalities at the mine. It is at that moment that Judd realizes he may never be able to go back down in the mines again. Jobs are relatively scarce in West Virginia if you're not a miner, so the only option for Judd is to leave his family and home state. Traveling south, Judd goes to Myrtle Beach, South Carolina to begin working for a timber company. Although he doesn't know much about logging, he is a diligent, honest, hard worker as well as eager to learn. His diligence and eagerness, along with his mechanical abilities, pay off and he quickly begins to move up within the company. Larkin Heyward wants more from life than to just be a dutiful wife and good mother to an up-and-coming young, local businessman. She would like nothing better than to follow in her older brother's footsteps and become a missionary in Appalachia. Until she can join her brother, she fills her time as a candy-striper at a local hospital where she brings joy to many she meets and attends to, and begins to enjoy the companionship of Judd Markley. Then a devastating hurricane hits Myrtle Beach and the city will never be quite the same. Judd even takes time off from work to travel back to West Virginia because that same hurricane has caused wreck and ruin at his family's farm. Larkin is traveling with him and plans to continue on to Kentucky to see someone that Judd only knows as the mysterious "Ben." Although Judd plans to head back to South Carolina after helping his family, Larkin plans to stay in Appalachia. How can their relationship go to the next step if they're in different states with seemingly different life goals? Can their relationship go the next step or is this the end? I actually read The Sound of Rain by Sarah Loudin Thomas a few weeks ago and as you can see, the story has stuck with me. There are parts of the story that are incredibly sad, but through it all I found this to be an uplifting and heartwarming story and not just because of the religious aspects (yes, this is a religious fiction book, namely Christian fiction but as a non-Christian reader I thoroughly enjoyed it). Ms. Thomas finds a way to incorporate basic ethical and moral values into a story without bashing the reader over the head with the lesson. This story leaned heavily towards Christian fiction as opposed to inspirational fiction simply because there's more discussion of the Christian faith and numerous scriptural references included in the storyline. At first, I thought Larkin was a bit flighty, but once I got to know her I couldn't help but admire her tenacity and spirit to overcome the societal norms of the time and try to do something different, even in the face of her father's disapproval. Judd is a quiet man that works hard, has few good friends, and always tries to see the good in people rather than being judgmental. Yes, there's romance but the romance is slow to build and is tender and heartwarming. Yes, there is drama and most of it is caused by Larkin and her father. There aren't really any bad guys in this story, although there are one or two guys that do questionable things. The Sound of Rain is a story about faith, family, romance, and endurance. I could go on and on about this sweet and touching story, but I'll simply say that if you enjoy reading well-written inspirational or Christian fiction with interesting characters and storylines, then you'll definitely want to read The Sound of Rain. 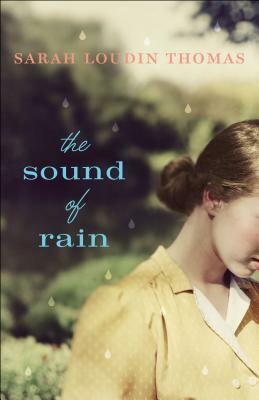 If you're not sure about the Christian fiction component, but just want a feel-good historical fiction read, then I suggest you grab a copy of The Sound of Rain to read. I have read everything by this author and am looking forward to reading more from her in the future. Disclaimer: I received a free print review copy of this book from the author/publisher. I was not paid, required, or otherwise obligated to write a positive review. The opinions I have expressed are my own. I am disclosing this in accordance with the Federal Trade Commission's 16 CFR, Part 255: "Guides Concerning the Use of Endorsements and Testimonials in Advertising." Sometimes, when I feel discouraged about my writing, I circle back and read your reviews. Thanks for being such an encouragement!